Amazon is publishing my novel! 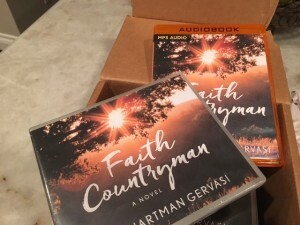 When my first batch of Faith Countryman Audiobooks arrived, I went from absolute excitement to sheer panic within seconds. After seeing these words on the page so many times, what on earth would my novel actually sound like? But, thanks to the voice of accomplished book narrator Dara Rosenberg, it didn’t take long to fall into a fantastic audio experience. And into a story I knew so well, almost too well, in a fresh and new way. So, how does she do it? How does Dara read an entire book, perform it without a stammer, a gasp, some weird breathing fit, or a nasty case of laryngitis? For starters, she’s a real pro. A nationally recognized voiceover artist with almost 200 audiobooks and dozens of national TV commercials on her resume. She is also the daily newsreader for Time Magazine, Huffington Post, CNN, & Reuters. With a BFA in Drama from NYU’s Tisch School of the Arts, Dara has a studio in her home in NYC where she lives with her husband, Alex. Your voice is truly beautiful Dara! How did you get started in the audiobook business? The voice of Faith Countryman: Narrator Dara Rosenberg. Thanks so much Lori! I started recording audiobooks about five years ago. I had been a full-time voice-over artist and mostly did commercials and fun stuff like that. One day my agent got me an audition at Audible and the next week I recorded my first book! After that, it was very clear to me that telling stories and narrating books was exactly what I wanted to do. Would you describe your audiobook recordings as narrations or performances? Or a combination of both? I think it is a little bit of both. It really depends on the genre and the story itself. If it’s a first-person story, then you really have to become the character, and not exactly put on this giant performance, but give it a really subtle touch that you are that person and you are explaining your story. In nonfiction it becomes a lot more of a narration. How many audiobooks have you recorded? Are there some that were far more challenging than others? How so? As of yesterday, I just finished my 188th book! There are definitely some that are more challenging than others. A lot of the time I find much in common with the main character, so it’s just easier because we speak alike. If there are a TON of characters that can be a little more daunting. You just have to take it slow and make each character his or her own real person. Sometimes nonfiction can be tough, depending on the topic. I recently recorded a book about diamonds, and while I thought I knew everything about diamonds (!) =), I realized I had to look up how to say a word correctly in every other sentence. Your voice is pure and clear and very easy to understand. Do you have to work to keep it healthy? Vocal exercises? Special gargling solutions perhaps? Do you have to rest your voice a lot? I think a lot of it is technique. I went to Drama School at NYU’s Tisch School of the Arts and my training in voice and speech has really helped me. A few years ago, I never could have recorded as much daily as I do now. I have learned how to control my voice and not speak at concerts, games, and loud restaurants. I’m that uncool friend that walks into a restaurant and says, “ It’s really loud in here… can we go somewhere else?” I do steam my voice with a steamer every morning. I don’t know if it does anything. It just makes me feel better! There were many scenes in Faith Countryman where you performed not only Faith’s narrator voice, but also lines of dialog using several different voices all in one scene. How do you keep from getting confused about who’s who while reading in a production session? What type of reading and preparation is involved in pre-production to make sure you don’t mix up the voices of characters while recording? Well, I think that your story flowed really well. It was obvious in the moment who was speaking because the story presented itself that way. So the work was done for me! I always read the book before I begin. Just to look up any pronunciations and if there are accents, questions about characters, anything! I like to have all that knowledge up front before I dive in. What types of voices and personalities do you enjoy performing most in the novels you work on? Obviously, if a personality is close to my own, it’s always a lot easier to represent the character. However, there is nothing better than a wacky crazy grandma or some fun character that just makes everything better! They usually aren’t the lead characters but they pop in and out of scenes. That’s always fantastic. Are there other voice-related jobs you do? Are you an actress or a singer or a radio show performer? Yes. I do have a few commercials running now and I work a lot with businesses on corporate presentations and all kinds of work! Sometimes I might be that “on-hold” messaging voice if you call a big company. My husband sometimes hears me randomly when calling a large company. Is this a career you can work on in your home with your own equipment, or do you go to a recording studio to produce the audiobooks? It’s a lot of both. I do have a studio at my house, and depending on the project, I do them in-studio or at home. I really love doing both. Sometimes being in a vocal booth by yourself all day can get lonely, but luckily, I get to venture out to studios in NYC all the time. 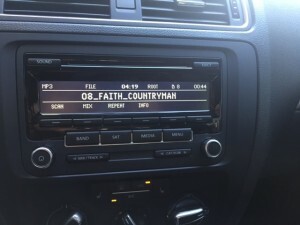 From your unique point of view, what can you tell a prospective reader/listener about the experience of listening to the Faith Countryman audiobook? Well, the thing I loved about Faith Countryman was how positive it was. So many stories today are dark and depressing, and it was a good week while recording this one. I felt lighter and just all around happier recording this story. Faith is an incredible woman and I think we all wish we could have a little part of her in ourselves. My husband, Frank, and I are back home and breathing a sigh of relief after one of the worst fires in Southern California’s recent history. Thankfully, the Sand Fire missed our house, but many of the nearby hills and canyons were destroyed. Burning a horseshoe around our neighborhood, the flames moved hill to hill, unpredictably jumping from one area to the next. I rushed to evacuate, moving in with my mom, while Frank stayed behind until the smoke became so thick he could no longer see flames. This is actually my third evacuation due to fire. The first time, I was five years old and living in Northern California, when my mom packed all my clothes and forced me into whatever weird little outfit was left, to go to our friends’ house for safety. The second time was several years ago when I packed up our whole family. So when the Sand Fire hit, you would think I’d know how to do this sort of thing. But this time was different. The fire was closer, bigger, and completely out of control. So I grabbed the “irreplaceables”, photographs and documents, computer items, our dog, a few other things, and then I took off speeding down the road. 1. 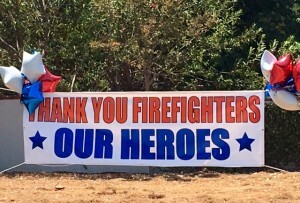 Firefighters are amazing. I never saw a group of people work so hard in such hot and horrible conditions. They bravely took great risks to save us and our homes. 2. If you have to wait out a firestorm, it’s a sweet comfort to be with your mom. Mine is 86, but I was once again reminded that she’s a dear soul and a real trooper. 3. My packing is ridiculous. I didn’t even prepare an overnight bag. I later made a list of the things I should’ve taken with me. This is now my “go” list. 4. Even more curious were some of the items my husband kindly packed for me when he later evacuated. My least favorite shoes that blister my feet by the time I get across the room. A pajama top. A bathing suit coverup. 5. A normal day of my ordinary life in my regular home is truly a beautiful thing. 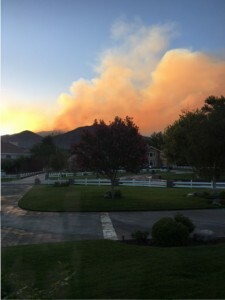 It just so happens that there’s a short scene about a wildfire in my upcoming novel Faith Countryman. That’s when things heat up for the first time in Faith’s young life. But I promise you, it’s not the last. Faith Countryman is scheduled for release September 27, 2016. Pre-orders are now underway at https://amzn.com/1503936295.